To be honest, I never intended for this recipe to end up on the blog, I just had an open tin of pumpkin purée from the Pumpkin Pie Pancakes I shared recently, so needed to find an exciting way to use it up! 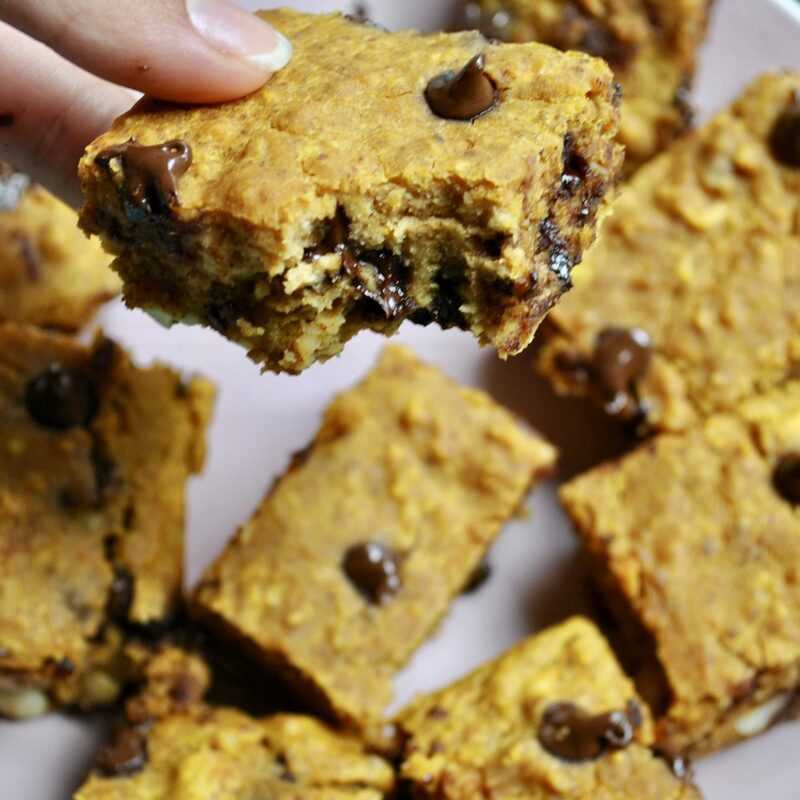 Then this happened… And after the success of my Secret-Ingredient Blondies, I have no doubt that these Vegan Pumpkin Chocolate Chip Blondies will be just as popular with everyone who is lucky enough to try them! 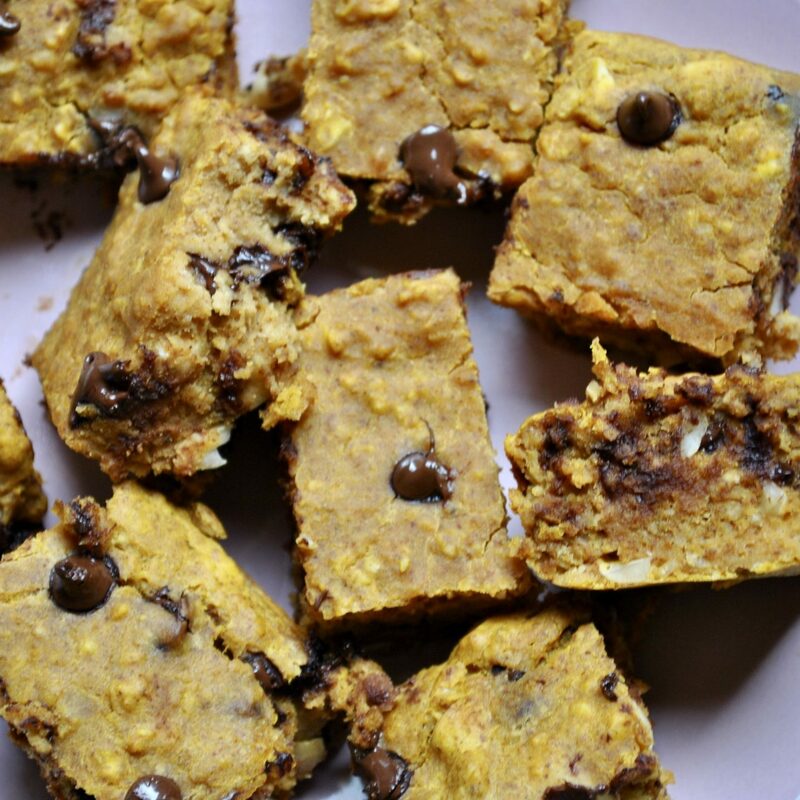 These gooey chewy blondies are incredible served warm for an extra special treat, or equally delicious just as they are – as a picnic snack, BBQ dessert, dinner party treat or simply to munch on while watching your favourite Netflix show. The soft fudgy texture is complemented by the a little crunch from the cashews and melt-in-your-mouth chocolate chips. 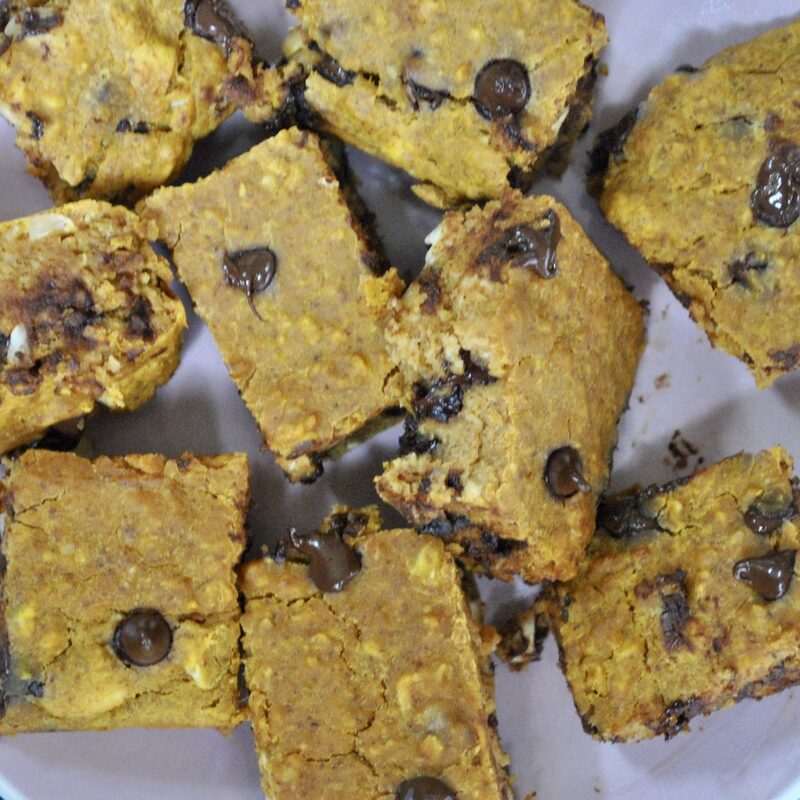 These pumpkin blondies contain NO oil, NO eggs and NO butter (or any kind of dairy). In addition, they’re gluten-free and refined sugar-free, making them suitable people with all sorts of dietary choices or intolerances! 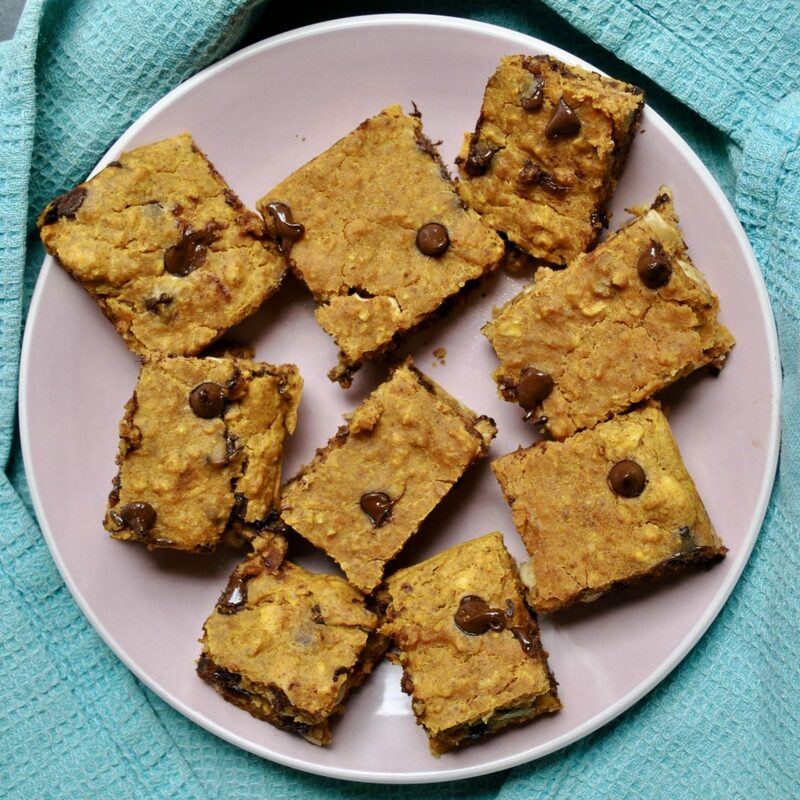 Instead of using the traditional unhealthy ingredients, the richness of almond butter and the moisture of pumpkin purée work to bind the ingredients together here. Pre-heat your oven to 180 C and line a square baking tray with greaseproof paper. In a large bowl, combine the pumpkin purée, almond butter and maple syrup and mix well. Then stir in the yoghurt, milk and vanilla and mix until smooth. 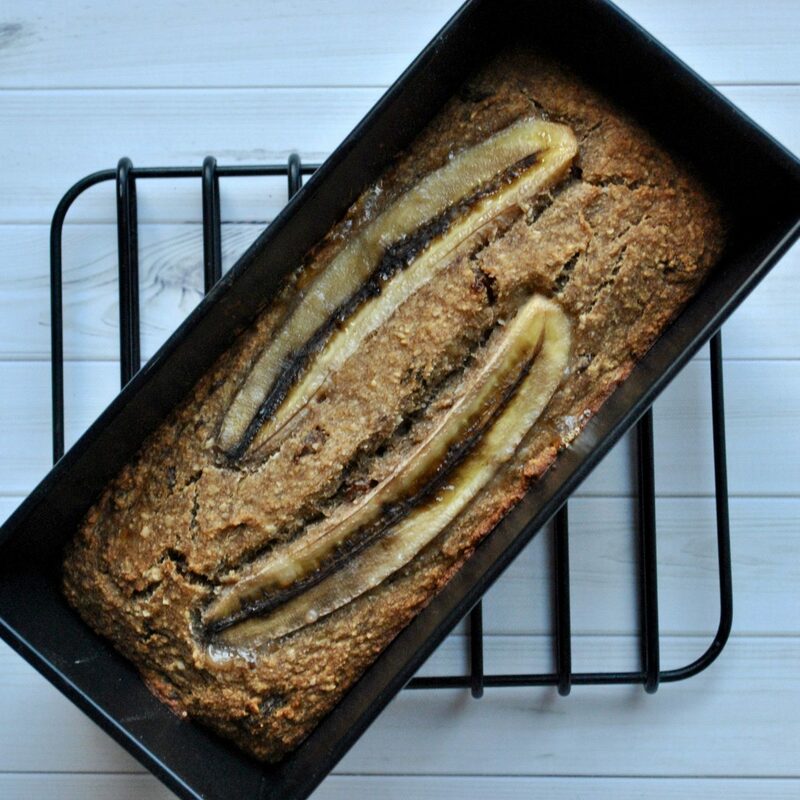 In a separate bowl, mix together the oats, flour, baking powder and cinnamon. Add the dry ingredients to the wet ingredients and mix until fully combined, then fold in the chocolate chips and cashews. Pour into the lined baking tray and bake for 20 minutes.